Permitted development rights allow householders to improve and extend their homes without the need to seek a specific loft conversion planning permission from Local Authority, however only if certain criteria are met. This means works can start as soon as the customer, contractor and building control are ready to go ahead. It is advised to seek neighbour written approval before though, and is required if there will be any works whatsoever to the party wall between properties. This idea was first introduced in “The Town and Country Planning (General Permitted Development) Order 1995”, since then it has been updated 37 times. As of April 2015 a new law act has been enacted – “The Town and Country Planning (General Permitted Development) (England) Order 2015” which can be found here. Please note that in some cases these rights may be removed by Local Authority. In these cases loft conversion planning permission is always required. 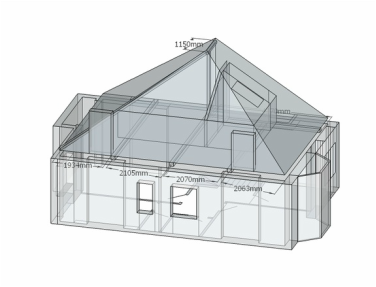 What do I do if loft conversion planning permission is required? First, the plans have to be drawn. Since planning departments in Local Authority require certain standards, this means an architect and most often a structural engineer needs to be hired. Second, plans are submitted to planning department of Local Authority. There are several stages in which they process submissions. During that time, they may request changes to loft conversion planning, as well as additional reports, for example arboricultural report if there are any trees in proximity of the house. Please note it often takes months before final approval. When do I not need loft conversion planning permission? When scope of works falls under “permitted development”. A list and explanation of two most interesting classes, point by point, under which the loft conversions London can proceed as permitted is described below. It is worth noting that many councils offer ‘permitted development approval’. It is still paid service, however usually costs less than loft conversion planning permission and also takes quicker to obtain. It is useful if we are not sure if rules for permitted development apply to our case. Article 3 Schedule 2 Part 1 Class B - The enlargement of a dwellinghouse consisting of an addition or alteration to its roof. B.1 (a) Development is not permitted if “permission to use the dwellinghouse as a dwellinghouse has been granted only by virtue of Class M, N, P or Q” of Schedule 2 Part 3. These classes cover change of use of buildings from shops, financial and professional services, betting offices, loan shops, amusement centres, casinos, storage and distribution centres and finally agricultural buildings. Very important is that the above include mixed use as well. Please note there is no mention of Class O, which covers offices. 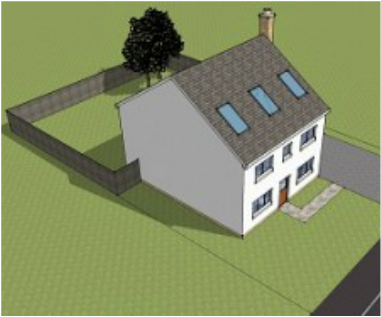 Chimneys, firewalls, parapet walls, skylights and other protrusions above the main roof ridge line should not be taken into account when considering the height of the highest part of the roof of the existing house. The effect of this is that dormer windows as part of a loft conversions London, or any other enlargement of the roof space, are not permitted development on a principal elevation that fronts a highway. Roof-lights in loft conversions London on a principal elevation may however be permitted development as long as they meet the requirements set out under Class C (covered later on in this article). In most cases, the principal elevation will be that part of the house which faces (directly or at an angle) the main highway serving the house (the main highway will be the one that sets the postcode for the house concerned). It will usually contain the main architectural features such as main bay windows or a porch serving the main entrance to the house. Usually, but not exclusively, the principal elevation will be what is understood to be the front of the house. There will only be one principal elevation on a house. 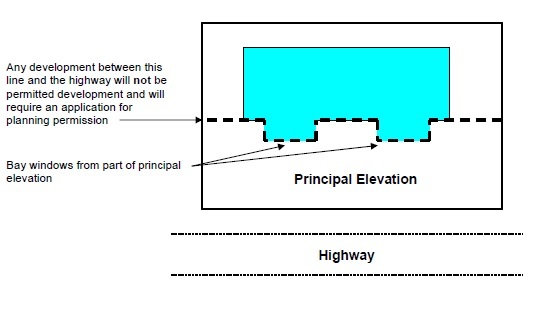 Where there are two elevations which may have the character of a principal elevation (for example, on a corner plot), a view will need to be taken as to which of these forms the principal elevation. ​The principal elevation could include more than one roof slope facing in the same direction - for example, where there are large bay windows on the front elevation, or where there is an ‘L’ shaped frontage. 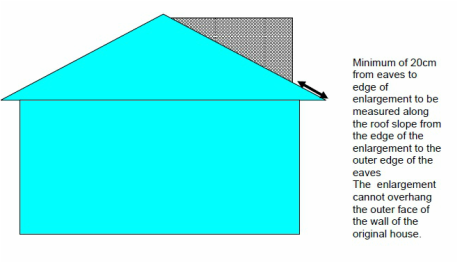 In such cases, all such roof slopes will form the principal elevation and the line for determining what constitutes “extends beyond the plane of any existing roof slope” will follow these slopes. Many, if not most, of houses in London are therefore terrace houses. Please note that “original roof space” is for “original building” as it was first built. Any later additions, alterations and extensions (including loft extension London) do not count towards it. They do however count towards “resulting roof space”. G. The installation, alteration or replacement of a chimney, flue or soil and vent pipe on a dwellinghouse. Point (a) of Class G is the same as for Class B and was explained earlier. Point (b) is important only if there are any works to the chimney/pipe in question. So if, for example, we are doing loft conversions London, keep the old chimney intact and it is above 1m from the roof then it is permitted development. However, if we direct a flue pipe through the chimney then it has been altered and development is no longer permitted. Point (c) is valid in the same areas as point B.1 (f), which is covered right below. B.1 (f) Development is not permitted if “the dwellinghouse is on article 2(3) land”. This article is rather self-explanatory. We will quote it right below. Same condition is imposed in plenty other classes of permitted development and is probably the most significant factor to popularity of second hand bricks. Worth noting is that new and old materials must be similar only in the appearance. They do not have to be the same materials at all. Moreover, in most inspections, appearance is checked from the street below. So, for example, there are white wooden casement windows in the house already. We can put new UPVC windows as long as they are white, casement and the frame is roughly same thickness. Also, flat roofs are considered invisible from street level, and their surface appearance is unimportant. Edges, fascias and gutters appearance however is important. An example of “not practicable” 200mm to eaves is when there is an existing dormer on previously built loft extension London and we want to join another dormer to itIt is sometimes necessary to remove the eaves of the original roof while works are carried out. To be permitted development eaves that are temporarily removed should be reinstated. The measurement of 200mm should be made along the original roof slope from the outermost edge of the eaves (the edge of the tiles or slates) to the edge of the enlargement. Any guttering that protrudes beyond the roof slope should not be included in this measurement. In any case it cannot protrude over the wall below. Fascias, gutters, etc are not considered part of roof enlargement. All manufacturers producing obscure glazing certify it for “privacy level, normally rated on a scale of 1-5, with 5 providing the most privacy. To be permitted development, side windows should be obscure glazed to minimum of level 3. Obscure glazed does not include one-way glass. This is quite important as it basically states that only rear-facing dormers can have clear glass (front-facing dormers are not permitted at all due to point B.1(c)). If a window is on a staircase or landing (not in a room) the 1.7 metre measurement should be made from the stair or point on a landing immediately below the centre of the window, upwards to the opening part of the window. Article 3 Schedule 2 Part 1 Class C - Any other alteration to the roof of a dwellinghouse. C.1 (a) Development is not permitted if “permission to use the dwellinghouse as a dwellinghouse has been granted only by virtue of Class M, N, P or Q” of Schedule 2 Part 3. Same as before in B.1 (a). The classes cover change of use of buildings from shops, financial and professional services, betting offices, loan shops, amusement centres, casinos, storage and distribution centres and finally agricultural buildings. The above includs mixed use as well. This point is very important for rooflights if they are to be on the front elevation of house. Rooflights and other new protrusions elsewhere can sometimes fit under class A (side and rear extensions) or more often class B, which was explained earlier. Most rooflights can fit in the 150mm, dome-like skylights however are usually bigger. Gutters and fascias, whether old or new, do not count. Same as before in B.1(b). The chimney, flue, etc, as mentioned in B.1(e), can fall under class G. The solar cells however are a bit of tricky question. They are not mentioned in class B. There is however Article 3 Schedule 2 Part 14 Class A which is specifically for solar cells on both dwellinghouses and blocks of flats. All manufacturers producing obscure glazing certify it for “privacy level, normally rated on a scale of 1-5, with 5 providing the most privacy. To be permitted development, side windows should be obscure glazed to minimum of level 3. Obscure glazed does not include one-way glass. This is important as it means rear- and front-facing rooflights can have clear glass but not side-facing. So what can I do with loft conversion as permitted development? Roof shape: permitted changes on sides and rear, but on front practically not. Cannot raise the highest part of roof. Cannot have increase over 40-50 m sq in roof-space, counted throughout the whole building history. Dormers: permitted new on sides and rear, but not front. Side dormers need obscure glazing, rear can have clear. Cannot protrude over the building wall. ​​Rooflights (Velux, etc): permitted new on all sides, side rooflights need obscure glazing, front and rear can have clear. Need to be less than 150mm high. Materials: need to be lookalikes to what building has already, but do not have to be the same. Listed buildings: changes permitted in class C but not in B, so no shape changes or dormers. Do not forget English Heritage will want to inspect and can force reversal of any works. 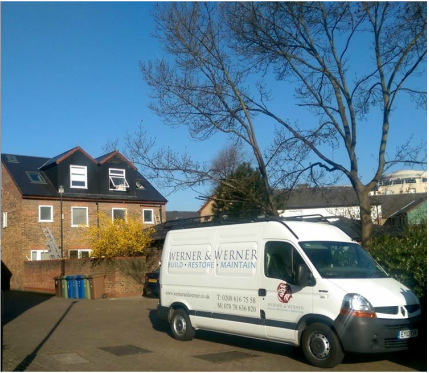 If you plan to start loft conversions London or Loft extension London project please contact us at your convenience and we will arrange a free consultation meeting and, after gathering required information, we will send no obligation and detailed quote.